Retirees: Should You Get Rid of Your Bonds? Maximizing the amount of money you leave to your heirs. The results were rather shocking. So shocking, in fact, that there’s a good chance you’ll read about it elsewhere (which is why I’m hoping to prepare you for what you’ll hear). What Wade found was that, given the assumptions he used, the ideal allocations for retirees involved only stocks and fixed lifetime annuities. That is, the ideal allocations included no bonds, no inflation-adjusted lifetime annuities, and no variable annuities (although I don’t think many people will find that last part to be particularly shocking). What’s important to understand, however, is that Wade’s paper is not about showing you how to allocate your money — at least not directly. Rather, it’s about creating a new method for analyzing various allocations — by looking at how well each allocation meets those two goals above, rather than looking at, say, the allocation’s probability of running out of money within 30 years. The specific results that Wade provides in his paper are only an example of one such analysis. And they use a very specific (though mostly reasonable) set of assumptions (about stock and bond returns, correlations between them, rates of inflation, and so on). When those assumptions are changed, the results might look very different. In other words, for individual investors, the takeaway is not that you should dump all your bonds in favor of stocks and/or fixed lifetime annuities. Rather, the takeaway is simply that a portfolio completely eschewing bonds in favor of lifetime annuities might not be completely-off-the-wall-crazy. And, given how far such a portfolio would be from conventional retirement recommendations, that’s very interesting. I hope we’ll see more research along these lines in the near future. A one-time decision to move a portion of one’s portfolio to an inflation-adjusted lifetime annuity because recent returns have been good and interest rates are high (which, depending on circumstances, could be a perfectly wise decision). In other words, I don’t think it’s particularly useful to ask whether rebalancing is a form of market timing. I think it’s more useful to get right to the point and ask if you should rebalance your portfolio and, if so, when you should do so. What Would Happen if You Never Rebalanced? In my view, the primary goal of rebalancing is to keep the risk level of your portfolio approximately where you want it to be. If you never rebalanced, it’s likely that stocks would eventually dominate your portfolio because of their higher long-term returns, thereby causing your portfolio to get riskier and riskier as you age. For most people, that would not be a good thing. And if you’re going to be rebalancing, you obviously have to settle on some plan as far as when to do it. And you have to choose between the various options somehow. One way to choose between rebalancing methods would be to select based on ease of implementation. That might lead you to rebalance, for example, every year on your birthday (woohoo! rebalancing party!) or to use an “all-in-one” fund that rebalances for you automatically. Or, you could go about the risk-control directly, checking your portfolio on a regular basis and rebalancing any time your asset allocation is out of whack by more than a certain amount. For example, in his Only Guide You’ll Ever Need for the Right Financial Plan, Larry Swedroe suggests rebalancing when a holding is off by an amount equal to 5% of your portfolio balance or 25% of the holding’s intended balance. Alternatively, you could choose based on some rationale for why a given method might earn slightly better returns than another method. For example, you might note that stocks have historically shown momentum over periods of less than one year, so you choose to rebalance every two years rather than rebalancing more frequently. I think any of the above rebalancing strategies would be perfectly reasonable — even if they could be referred to as market timing. Most important, in my opinion, is to pick a method and stick with it so that you know your asset allocation (and therefore, the risk level of your portfolio) will not get too far out of whack. “My wife and I have a variable income. In previous years, our income has been high enough to max out our retirement accounts and still have money left over to invest for retirement in a taxable account. If there’s little or no capital gains tax to pay from selling the holdings (because your cost basis is approximately the same as the current market value, because you have a capital loss carry-forward from a prior year, or because you have a capital gain but are in the 15% or lower tax bracket such that long-term capital gains would be taxed at a 0% rate), then there is no downside to selling the taxable holdings. If you would have to pay tax on a large capital gain, the question is somewhat trickier. In a case like this, you would want to consider how your current capital gain tax rate compares to the capital gain tax rate you expect to face in the future. For example, if you have a 15% tax rate on capital gains right now, and you don’t expect that tax rate to be any lower in the future, then you (usually) might as well go ahead and pay the tax now, contribute the money to a retirement account, and get tax-free growth going forward. In contrast, let’s say you expect to retire within a couple years, and you expect to have a 0% tax rate on long-term capital gains in retirement (e.g., because you expect the current tax structure to continue, and you expect to have little taxable income in retirement). In such cases, it would probably be best to keep holding the taxable investments in order to take advantage of that lower rate in the future. You’ve written before about viewing all your accounts as one portfolio. 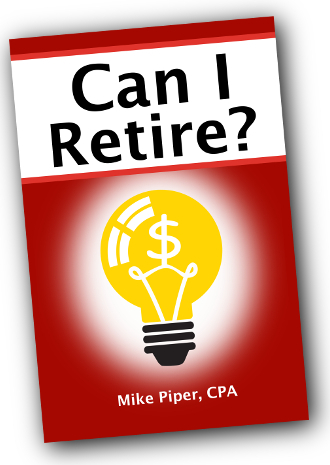 What about when you have some money that’s not intended for retirement? In my opinion, the easiest way to choose investments is on a goal-by-goal basis. For example, money intended for retirement savings has one asset allocation, money intended for your kids’ college education has another asset allocation, money intended for a home downpayment in a few years has another allocation, and your emergency fund has yet another allocation. And (for the most part) those allocations are chosen independently of each other. In other words, I would select an asset allocation for my retirement savings (using the all-one-portfolio idea to minimize costs and complexity), then I would separately select an appropriate asset allocation for each significant non-retirement savings goal. How to Allocate for Shorter-Term Goals? 10-20 years: 40% stock (e.g., Vanguard LifeStrategy Conservative Growth Fund). In other words, for any goals less than 5 years away, my personal inclination is to stick with things that are very safe, such as CDs. And for goals in the 5-20 year range, I think it starts to make sense to consider a modest stock allocation. But that comes with two huge caveats. First, as we’ve discussed before, asset allocation is not a precise science. That’s every bit as true in the short-term as it is in the long-term. Is the dollar amount of your goal flexible, or is it absolutely crucial that you have at least as much money at the end of the period as you have at the beginning? Then there’s the emotional component of risk tolerance as well: Could you take a 10% loss in stride, or would it cause a great deal of mental distress? What about a 20% loss? 30%? You’ll want to choose an allocation that accounts not only for the economic impact of a loss, but the emotional impact as well. I’m currently reading Charles Farrell’s book Your Money Ratios. In the book, Farrell suggests that once your retirement savings reach 12-times your annual salary, you should be able to retire. Interestingly, just a few weeks ago, I encountered an article in The New York Times stating that you need 20-times your annual salary in order to be able to retire. That’s a huge discrepancy! The NYT writer (Teresa Ghilarducci) is suggesting you need 67% more money than Farrell says you need. So who is right? When we talk about retirement planning, there’s always a great deal of uncertainty: investment returns, how long you’ll live, how your tax rate will change over time, etc. But, by basing the how-much-do-I-need number on the reader’s pre-retirement level of income rather than spending, the writers above are adding yet another source of uncertainty and imprecision. For example, the higher your income level, the greater the portion of your pre-retirement income that you’ll have to satisfy with your portfolio, because Social Security will replace a smaller portion of your pre-retirement income than it would for somebody with a lower earnings history. Or, if you expect to pay off your mortgage shortly after retiring, you’ll be able to get away with replacing a much lower portion of your pre-retirement income than somebody who plans to rent throughout retirement. Or, if you started saving very early, such that you’ve been able to use a low savings rate throughout your career, you’ll have to replace a higher portion of your pre-retirement income than somebody who was late to the game but who adjusted to living on just 60% of her pre-retirement income in order to catch up on retirement savings. When expressed as a multiple of end-of-career salary, the multiple one person needs to reach in order to retire could be twice as high as the multiple another person needs to reach. If you want to get a good idea of how much you need saved in order to retire, it makes more sense to go about it directly — by looking at the expenses you hope to satisfy. How large a lump sum will it take to finance that spending? Even when you base your retirement calculations on your actual expenses, there are numerous uncertainties left in the planning. There’s no need to use a rule of thumb that adds yet another layer of potentially-wrong assumptions.